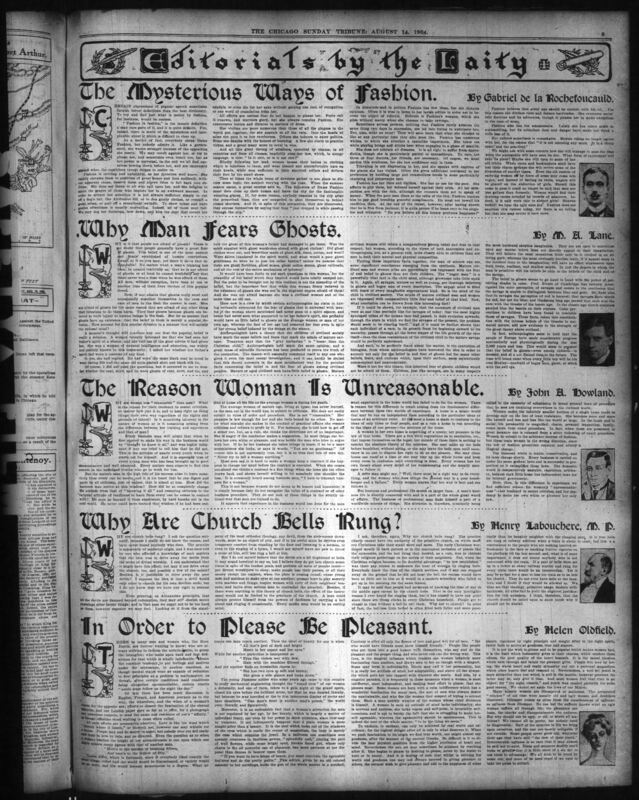 Reading this article from page 5 of the Chicago Tribune dated 8/14/1904 makes me kind of dizzy and I’m left trying to simultaneously figure out if ghosts lose socks in their laundry and if I am a savage or a woman of advanced age. Given how popular paranormal shows are on TV, I wonder what Mr. M. A. Lane would say about his (wrong) prediction that the belief in ghosts was short lived and doomed? Why is it that people are afraid of ghosts? There is no doubt that people generally have a great fear of ghosts. This belief is one of the most ancient and firmly established of human convictions. Laugh at it as you may, yet there it is – a fact indisputable! No matter what a man’s training has been, he cannot truthfully say that he is not afraid of ghosts, or at least he cannot truthfully say that there was never a time when he was afraid of them. All men, without exception, have been at one or another time of their lives victims of this popular dread. Now, if one admits that ghosts really exist and occasionally manifest themselves to the eyes and ears of men in the flesh the answer is easy. Men are afraid of ghosts for the same reason they are afraid are afraid of any other thing that threatens to do them harm. They fear ghosts because ghosts are believed to work injury to human beings in the flesh. But let us assume that ghosts have no existence; that the belief in them is merely a popular delusion. How account for this popular delusion in a manner that will satisfy the rational mind? A moment’s thought will convince any that the popular belief is really a delusion. A woman recently informed me that she had seen her father’s spirit at a séance, and she told me of the good advice it had given her. She was a woman of unusual intelligence and education, one widely and publicly known in this community. I asked her whether her father’s spirit had worn a costume of any kind. O, yes, she had replied. He had worn the same black coat he loved to wear during life and the same old style plaited shirt and black silk tie. Of course, I did not push the questions, but it occurred to me to wonder whether the coat, shirt, and tie were ghosts of coat, shirt, and tie, and how the ghost of this woman’s father managed to get them. Was the spirit supplied with ghost wardrobes stored with ghost clothes? Did ghost clothes wear our, and were they made of ghost silk, linen, cotton, and wool? Were shirts laundered in the spirit world, and what would a poor ghost gentleman do were he to lose his collar button? Unless we assume that there are ghost factories, ghost mines, ghost notion stores, ghost railroads, and all the rest of the entire mechanism of industry? It would have been futile to put such questions to this woman, for the absurdity of her belief which they implied would have totally escaped her. But the point to be brought out by this incident is not the absurdity of the belief, but the important fact that while this woman firmly believed in the existence of ghosts she was not in the slightest degree afraid of them! And she was not afraid because she was a civilized woman and at the same time an old one. Here now is a clew by which certain anthropologists lay claim to having rationally accounted for the fear of ghosts that is universal with men; for it the woman above mentioned had never gone to a spirit séance, and hence had never seen what purported to be her father’s spirit, she probably would have as little belief in ghosts as the average woman or man of her own age, whereas the fact of her age had removed her fear even in spite of her strong belief induced by the doings at the séance. Anthropologists have a theory that the children of civilized society have much the same beliefs and fears that mark the minds of mature savages. Tennyson says that the “gray barbarian” is “lesser than the Christian child.” Anthropologists held much the same opinion; and a great mass of scientific literature has been produced to prove the truth of the contention. 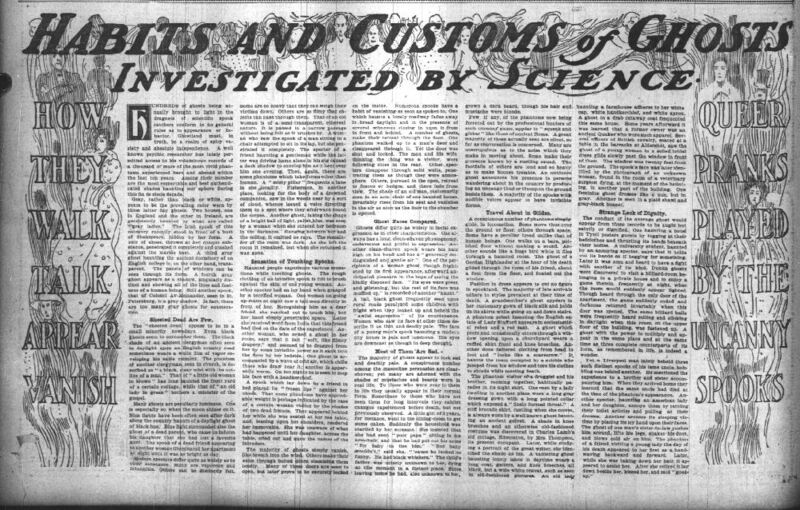 The theory will assuredly commend itself to any one who gives it even the most casual investigation; and it can hardly be denied that this theory accounts in the most satisfactory way for the peculiar facts concerning the belief in and the fear of ghosts among civilized peoples. Mature or aged civilized men have little belief in ghost. Mature civilized women still retain a comparatively strong belief and fear in that respect; but women, according to the views of both anatomists and anthropologists, are, as a general rule, more closely akin to children than are men in both their mental and physical composition. Putting these important facts together, the man of science can see some significant conclusions emerging from the synthesis. Mature civilized men and women alike are proverbially less impressed with the fear of and belief in ghosts than are their children. The “bogey man” is a powerfully vital fact in the child mind, although grownups take little stock in it. Again, all savages, mature as well as young, are thorough believers in ghosts and bogey men of every description. The savage mind is filled with fears of every imaginable supernatural kind. So is the mind of the child in civilized society. The minds of mature civilized men and women are impressed with comparatively little fear and belief of that kind. Now, what conclusion can be drawn from this interesting fact? If it could be shown, for example, that the ancestors of civilized men were at one time precisely like the savages of today; that the most highly developed tribes of the human race had passed, in their evolution upwards, through the state in which we find the savages of the present, the problem would seem to be clearing itself. And if it could be further shown that each individual of a race, in its growth from its beginning onward to its maturity, passes through all the lower stages of life growth of the race itself – then the close resemblance of the civilized child to the mature savage would be perfectly understood. And such, to be perfectly frank about the matter, it’s the conviction of biologists, from whom anthropologists have borrowed the idea in order to account not only for the belief in and fear of ghosts but for many other beliefs, fears, and customs which, upon their surface, seem mysteriously commonplace and unaccountable. Were it not for this innate, this inherited fear of ghosts, children would not be afraid of them. Children, just like savages, are in many respects the most hardened skeptics imaginable. They are not open to conviction upon any matter which does not directly appeal to their imagination. They will believe the most monstrous fable only be it clothed in an alluring garb; whereas the most obviously forcible truth, if it appeal more to the intellect than to the imagination, will have no effect whatsoever upon their lively, resilient, and shallow minds. In just the degree in which the man is primitive will his beliefs be akin to the beliefs of the child and of the savage. The belief in ghosts seems to go hand in hand with the power of perceiving shades in color. Prof. Rivers of Cambridge has recently investigated the color perception of savages and comes to the conclusion that the savage is unable to distinguish between blue and gray. He finds also that in savages the perceptions of red is keenest; that the savages have words for red, but not for blue; and Gladstone long ago proved that such was the case with the Greeks of the heroic age. In the classic age Green sculptors painted blue on the beards on their statues. Color perceptions in children have been found to resemble those of savages. These facts, taken into consideration with the intense belief of the Greeks in animated nature, add new evidence to the strength of the ghost theory above outlined. In fact, anthropologists seem to hold that the people of Europe have made considerable progress anatomically and physiologically during the last 2,000 years and less. This would seem to promise that the belief in ghosts – even among children – is doomed, and at a not distant time in the future. The time will hence come when every little boy will be his own Huxley – unafraid of the bogey man, ghost, or witch with an evil eye. 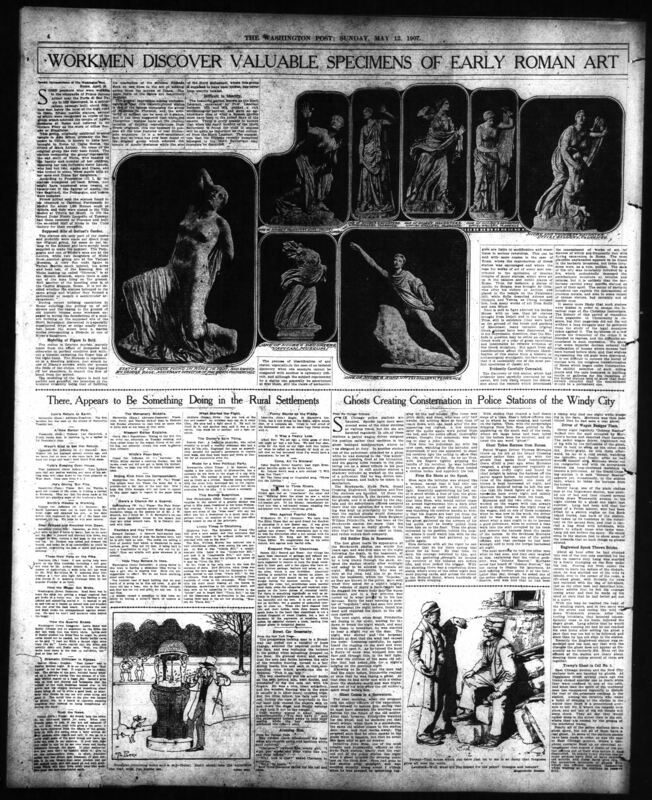 What do the Titanic, Sir Arthur Conan Doyle, early 20th century photoshop and ghosts have in common? More than I knew when I first read this article!! (Although I will say that my interested was more piqued by Miss Eleanor Ramos and her Saucy Stories magazine, but as this is a pg-13 page, I will let you google to see old covers, if you are brave enough!!) It was also interesting to find out that the book The Blue Island, discussed in the article was actually written (with an opening letter from Sir Doyle himself) and published and is still for sale on Amazon and Barnes & Noble. It Is the Haunted London Home of the Late W. T. Stead to Which, His Daughter Says, Her Dead Father Frequently Returns. ACCORDING to the dictionary, a hunted house is a place subjected to visitations from the world of spirits. In the popular imagination it is a ramshackle wooden structure, shrinking behind dusty hedge-rows, with broken windows invaded by the branches of trees through the tops of which the wind soughs in melancholy manner, or a dilapidated brick structure, stern and forbidding, with cold marble floors and metal banisters clammy and terrible to the visitors’ touch. But over in London, which seems to be just now the mecca of those who have been caught in the war-inspired interest in spirits and psychic manifestations, they have a different conception of a dwelling inhabited by the souls of those who have separated from the fleshy envelope called the body. They have neither terror nor curiosity for such a habitation. In fact, they have given ghosts a headquarters. The 200-year-old residence in old Smith Square of Miss Estell Stead, daughter of W.T. Stead, has been turned over to ghosts and this winter it is to be dedicated with formal ceremonies. Thus the invisible, save to the psychic, denizens of the world beyond the veil have been given a headquarters where they may meet and hold converse with those in the flesh. The spirit of the departed owner of the mansion will preside when the spirits hold a meeting. That he has never left the dwelling is the statement of his beautiful daughter. And to prove this assertion, she has the photograph, a copy of which is published on this page, showing the presence of her father’s spirit in the library of his late residence when the spirit photographer snapped him. This library also has been turned over to the ghosts. It is here that Miss Stead and her friends who believe in ghosts hold their séances. Around its walls are book shelves holding a thousand volumes on the subject of spiritualism. All of these are offered as sort of a public library on things ghostly. The members of Miss Stead’s circle are professional, business and wealthy folk who will give you sincere and very convincing testimony to the truth of their statement that ghosts are ghosts and can and do make themselves visible and communicative at the proper time and place. What they have done, they’ll inform you, is merely to give their incorporeal friends the proper place and appointed times when they may so manifest themselves. They speak of the coming visit to headquarters of this or that ghost in the tone of voice that one who doesn’t believe in spirits might announce they coming of a cousin by marriage. 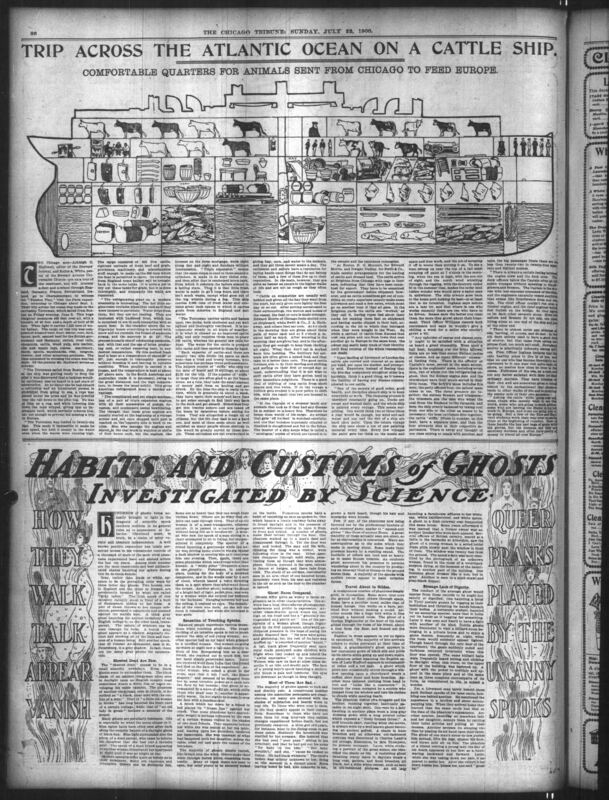 The become wroth only when “double exposure” or “double negatives” is suggested as an explanation of the weird “spirit” photographs, two of which hare printed on this page. But, as the “spirit photograph” at the top of this page bears witness, belief in ghosts has almost as much strength here as in England. 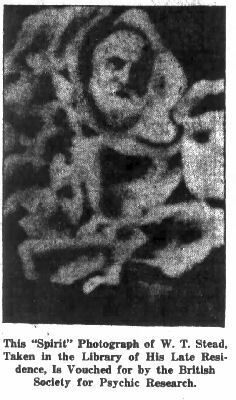 Many of the most conservative thinkers and persons known as unbelievers have been convinced that there is “something to it.” Among those are the witnesses to the taking of the fore-mentioned “spirit photograph” of the late Prof. Hyslop, produced in the course of an investigation conducted by Dr. Walter F. Prince, Chief Investigator of the Psychical Research Society. When they exhibit this photograph they will remind you, with a pardonable ring of triumph in their voices, that Prof. Hyslop is the same psychologist and spiritualist who promised h would return after death and disclose himself to those who have the faith. They will also recall to your mind the report that a week after his death he appeared at a banquet held in his honor and gave an automatic message through one of the psychic guests. But, in order to prove once and for all that spirits can be “caught” by a sensitize photographic plate, Miss Stead, in addition to throwing open her library of 1000 books on spirits, will, this winter, open to the public a private studio she is having constructed at some expense in the old garden to the rear of her home in which every facility for photographing spirits will be installed and every possible loophole for trickery will be eliminated. 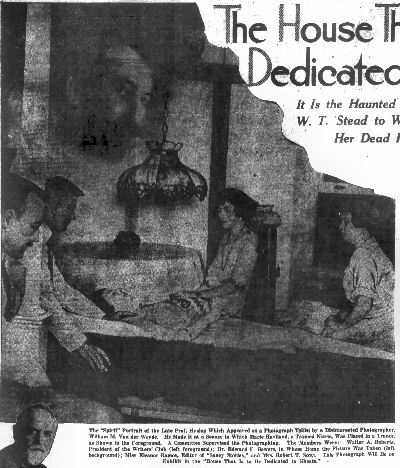 Unlike the great majority of those who are enthusiastic in the post-war psychic-phenomena, Miss Stead and her late father entertained ghosts long before the death of millions in the war accelerated the spiritist movement to its present unprecedented popularity. She says she has received numerous visits from the other side. Miss Stead declares that her father visits her regularly and that he is dictating to her the chapters of a book she will name “The Blue Island,” which recounts the experiences her late parent is having on the other side of the veil. 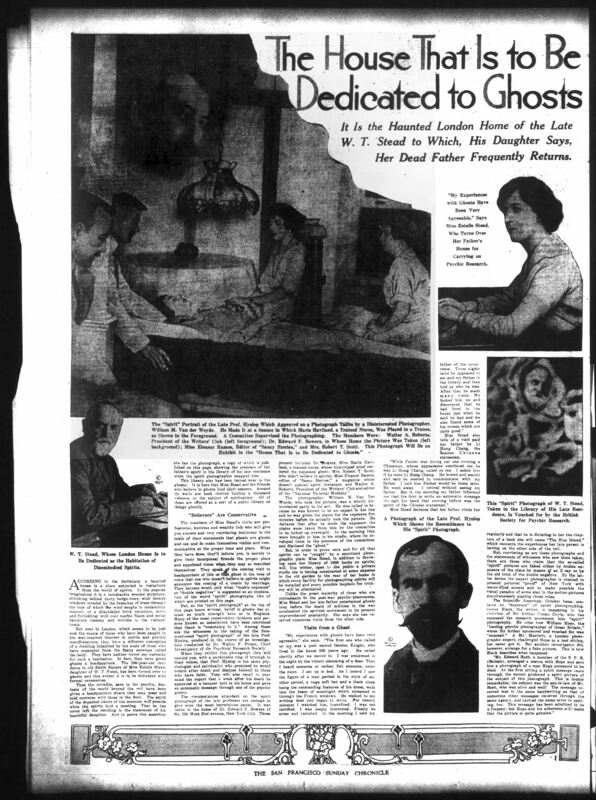 But, convincing as are these photographs and the statements of the witnesses who saw them taken, there are those who claim that the so-called “spirit” pictures are faked either by double exposure of the plate by means of an X-ray or by the old trick of the double negative. By the latter device the expert photographer is enabled to present pictorial “proof” of New York with water-filled streets and to make possible the visual paradox of some star in the motion pictures simultaneously playing three roles. Hundreds of ghosts being annually brought to light in the dragnets of scientific spook catchers conform to no general rules as to appearance or behavior. Ghostland must, in truth, be a realm of spicy variety and absolute independence. A well known psychic researcher has lately permitted access to his voluminous records of a thousand or more of the most vivid phantoms experienced here and abroad within the last ten years. Among their number are the most respectable and best authenticated shades haunting our sphere during the fin de siècle decade. Gray, rather than black or white, appears to be the prevailing color worn by these latter day ghosts. Two houses, one in England and the other in Ireland, are persistently haunted by what are called “gray ladies”. The Irish spook of this category recently stood in front of a bust of Shakespeare, hidden by her form. A pair of shoes, thrown at her opaque substance, penetrated it completely and crashed against the marble bust. A third gray ghost haunting the ancient dormitory of an English college is, on the other hand, transparent. The panels of windows can be seen through its form. A fourth gray ghost appears as a shadow, singularly distinct and showing all of its lines and features of a human being. Still another spook, that of Colonel Av-Meinander, seen in St. Petersburg, is a gray shadow. In fact, there are too many gray ghosts for enumeration. The “sheeted dead” appear to be in a small minority nowadays. Even black ghosts seem to outnumber them. The black shade of an ancient clergyman often seen in daylight upon an English country road sometimes wears a white film of vapor enveloping his sable raiment. The phantom of another clergyman, seen in church, is described as “a black, clear mist with the outline of a man.” That of “a little old woman in brown” has long haunted the front yard of a certain cottage, while that of “an old lady in green” bothers a minister of the gospel. Many ghosts are peculiarly luminous. One is especially so when the moon shines on it. Blue lights have been often seen after dark along the country haunts of a daylight ghost of black hue. Blue light surrounded also the ghost of a dead parent, who came to inform his daughter that she had lost a favorite aunt. The spook of a dead friend appearing to another woman illuminated her apartment at night until it was as bright as day. Modern specters differ quite as widely as to their substance. Many are vaporous and intangible. Others can be distinctly felt. Some are so heavy that they can weigh their victims down. Others are do filmy that objects can pass through them. That of an old woman is of a semi-transparent, ethereal nature. It is passed in a narrow passage without being felt as it brushes by. A woman who saw the spook of a man sitting in a chair attempted to sit in its lap, but she penetrated it completely. The specter of a friend haunting a gentleman while the latter was driving home alone in his gig caused a dark shadow to envelop him as it ben over him one evening. Then, again, there are some phantoms which take forms other than human. A “misty pillar” frequents a lane in one locality. Fishermen, in another place, looking for the body of a drowned companion, saw in the woods near by a sort of cloud, whence issued a voice directing them to a spot where they afterward found the corpse. Another ghost, taking the shape of a bright ball of light, palish blue, was seen by a woman when she entered her bedroom in the darkness. Hanging between her and the ceiling, ti emitted no rays. The remainder of the room was dark. As she left the room it remained, but when she returned it was gone. Hunted people experience various sensations while touching ghosts. The rough clothing of an invisible spook is felt to brush against the skin of one young woman. Another specter had an icy hand when grasped by a terrified woman. One woman on going up-stairs at night saw a tall man directly in front of her. Recognizing him as a dear friend, she reached out to touch him, but her hand simply penetrated space. Later she received word from India that this friend had died on the date of the experience. Another woman, who seized a ghost in her room, says that it felt “soft, like flimsy drapery,” and seemed to be dragged from her by some invisible power as it sank into the floor by her bedside. One ghost is accompanied by a wave of cold air, which chills those who draw near it; another is apparently warm. On hot nights he is seen to mop his face with a handkerchief. A spook which lay down by a friend in bed placed its “frozen lips” against her cheek. That some phantoms have appreciable weight is perhaps indicated by the case of a certain woman visited by the shades of two dead friends. They appeared behind her while she was seated at her tea table, and, leaning upon her shoulders, rendered her immovable. She was unaware of what happened until her daughter, across the table, cried out and gave the names of the intruders. The majority of ghosts simply vanish, like breath into the wind. Others make their exits through bolted doors, slamming them loudly. Many of these doors are seen to open, but later prove to be securely locked on the inside. Numerous spooks have a habit of vanishing as soon as spoken to. One which haunts a lonely roadway fades away in broad daylight and in the presence of several witnesses closing in upon it from in front and behind. A number of ghosts make their retreat through the floor. One phantom walked up to a man’s door and disappeared through it. Yet the door was shut and locked. The man and his wife, thinking the thing was a visitor, where following close in the rear. Other specters disappear through solid walls, penetrating them as though they were atmosphere. Others, pursued in the open, retreat to fences or hedges, and there fade from view. The shade of an old man, customarily seen in an arm chair of one haunted house, invariably rises from his seat and vanishes in the air as soon as the door to the chamber is opened. Ghosts differ quite as widely in facial expression as in other characteristics. One always has a long, clean-shaven physiognomy, cadaverous and pitiful in expression. 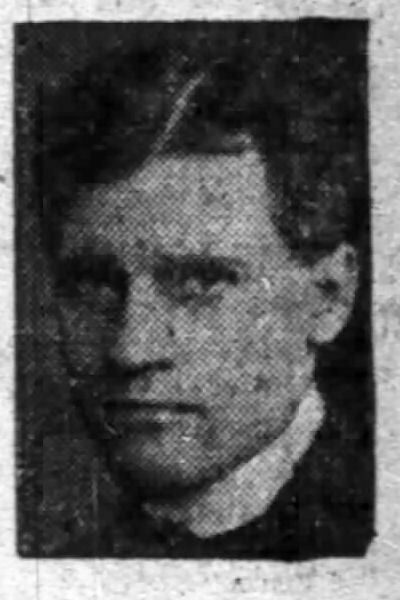 Another clean-shaven spook wears his hair high on his head and has a “generally distinguished and gentle air.” One of the percipients of a woman ghost, though frightened by its first appearance , afterward anticipated pleasure in the hope of seeing the kindly disposed face. “Its eyes were green and glistening, but the rest of its face was muffled up,” is recorded of another ‘haunt”. A tall, black ghost frequently seen upon rural roads paralyzed some children with fright when they looked up and beheld the “awful expression” of its countenance. Women who saw its face at other times describe it as thing and deadly pale. The face of a young man’s spook haunting a modern city house is pale and luminous. His eyes are downcast as though in deep thought. The majority of ghosts appear to look sad and deathly pale. A conspicuous number among the masculine persuasion are clean-shaven; yet many are adorned with the shades of mustaches and beards worn in real life. To those who were near to them in life they usually appear in their normal form. Sometimes to those who have not seen them for long intervals they exhibit changes experienced before death, but not previously observed. A little girl of 3 years, for instance, went to the dining-room to get some cakes. Suddenly the household was startled by her screams. She insisted that she had seen “poor papa” sitting in his armchair, and that he had put out his arms “for baby to tiss him.” “but baby wouldn’t,” said she, “cause he looked so funny. He had black whiskers. : The child’s father was utterly unknown to her, dying at this moment in a distant place. Since leaving home he had, also unknown to her, grown a dark beard, though his hair and mustache were blonde. Few, if any, of the phantoms now being ferreted out by the professional hunters of such uncanny game, appear to “squeak and gibber” like those of ancient Rome. A great majority of those actually seen are silent, so far as conversation is concerned. Many are unscrupulous as to the noise which they make in moving about. Some make their presence known by a rustling sound. The footfalls of others are loud and so heavy as to make the house tremble. An outdoors ghost announces his presence to persons wandering about in the country by producing an uncanny thud or thump on the ground beside them. A majority of the spooks with audible voices appear to have invisible forms. A conspicuous number of phantoms simply glade, in locomotion. Some move thus over the ground or floor, others through space. Some have a peculiar tread unlike that of human beings. One walks on a bare, polished floor without making a sound. Another sounds like a huge bird while it flies through a haunted room. The ghost of a Gordon Highlander at the hour of his death glided through the room of his friend, about a foot from the floor, and floated out the window. Fashion in dress appears to cut no figure in spookland. The majority of late arrivals adhere to styles prevalent at their time of death. A grandmother’s ghost appears in her customary gown of black silk and holds up its skirts while going up and down stairs. A phantom priest haunting the English estate of Lady Stafford appears in ecclesiastical robes and a red sash. A ghost which peers and occasionally enters through ha window opening upon a churchyard wears a ruffled shirt front and knee breeches. Another dons tattered clothing from head to foot and “looks like a scarecrow.” It haunts the room occupied by a suicide who jumped from his window and tore his clothes to shreds while meeting death. The phantom visitor of a druggist and his brother, rooming together, habitually parades in its night shirt. One seen by a lady dwelling in another place wore a long gray dressing gown with a long pointed collar which exposed a “finely formed throat.” A stiff brocade skirt, rustling when she moves, is always worn by a well known ghost haunting an ancient garret. A shade in knee breeches and an otherwise old-fashioned costume was discovered in Charles Lamb’s old cottage, Edmonton, by Mrs. Thompson, its present occupant. Later, while studying a portrait of a great writer, she identified the shade as his. A vanishing ghost haunting lonely lanes in daytime wears a long coat, gaiters, and knee breeches, all black, but a wide white cravat, such as seen in old-fashioned pictures. An old lady haunting a farmhouse adheres to her white cap, white handkerchief, and white apron. A ghost in a drab cutaway coat frequented this same house. Some years afterward it was learned that a former owner was an ancient Quaker who wore such apparel. Several officers of British cavalry, seated at a table in the barracks at Aldershot, saw the ghost of a young woman in a soiled bridal dress glide slowly past the window in front of them. The window was twenty feet from the ground. The spook’s face was later indentified by the photograph of an unknown woman, found in the room of a veterinary surgeon dying, at the moment of the haunting, in another part of the building. One feminine ghost dresses like a nun, but in gray. Another is seen in a plaid shawl and gray-black bonnet. The conduct of the average ghost would appear from these records to be aught but saintly or dignified. One haunting a hotel in Tyrol peters guests by tugging at their bedclothes and thrusting its hands beneath their bodies. A university student, haunted by an annoying specter, says that it holds out its hands as if begging for something. Later it was seen and heard to have a fight with another of its kind. Dublin ghosts were discovered to visit a billiard-room belonging to a private house and to enjoy a game therein frequently at night, when the room would suddenly appear lighted. Though heard through the only door of the apartment, the game suddenly ended and darkness returned invariably when this door was opened. The same billiard balls were frequently heard rolling and clicking in daylight when this room, on the upper floor of the building, was fastened up. A ghost with the power to multiply and appear in the same place at the same time as three complete counterparts of its form, as remembered in life, is indeed a wonder. Six Chicago police stations are haunted. Spooks have been seen around some of the other stations at various times, but the six are haunted regularly. In one of these stations a patrol wagon driver resigned his position rather than continue in the ghost besieged headquarters, where he was assigned to duty. In another station one of the patrolmen, attacked by a ghost while he was sleeping in the “dog watch” quarters upstairs fired at his tormentor, and six gaping holes remain in the plastering yet as a silent tribute to his poor marksmanship. In still another station a shadowy intruder so worked on the mind of a policeman that he was driven temporarily insane, and had to be taken to a sanitarium. The Stockyards, Hyde Park, Grand Crossing, Englewood, Desplaines, and New City stations are haunted. Of these the Stockyards station is the favorite retreat for ghosts, and it is admitted by the captain and the subordinate officers assigned there that the agitation for a new building was kept up principally by the hope that the station ghosts would disappear with the old headquarters. Desk Sergeant William Prindeville, who has been at the Stockyards station for more than ten years, has seen so many ghosts in his time that he has become used to them, and rather enjoys their company. The first ghost made its appearance at the Stockyards station one winter five years ago, and was first seen on the night following the death, in the basement, of an old soldier. The old fellow, worn out by a long tramp through the snow, entered the station shortly after midnight and asked to be allowed to remain all night. Sergt. Prindeville, who was on duty at the time, told him to go down into the basement, where the “bojacks”, as they are known to the police, were sent when they asked for a night’s lodging. The veteran of many a hard-fought battle dragged his weary body into the warm basement, and in a few minutes was curled up in what proved to be his last bivouac. Early the next morning a number of “regulars,” who had seen him enter the basement the night before, found him dead and reported his death to the officers upstairs. The next night, when Sergt. Prindeville sat dozing in his chair, waiting for the dawn to break the night watch, and send him home to breakfast, he was startled to hear a slight rap on the door. The night was stormy and the sergeant thought at first that the wind had caused the noise. Listening carefully, he again heard the rapping on the door and went at once to open it. As he turned the knob a flurry of snow was whipped into his face and through this, in the half light, he saw the outlines of the same old soldier that has asked him for a night’s lodging on the previous night. Knowing as he did, that the man had died the night before, Prindeville realized at once that he was facing a ghost. At that time he had never met with a visitor from the shadowy world and was frightened out of his wits when the old soldier’s spirit stood before him. The next morning, when the sergeant told the other officers of his experience, they refused to believe him, saying that he must have mistaken the whirling snow flurries for the figure of the old soldier. After that, however, Prindeville watched for the ghost, and he declares yet that every winter, when there is a snowstorm, the same old soldier comes to the station door, raps, and then walks away. The sergeant says that he often speaks to the ghost when it appears, but that he never has been able to get an answer. Detective John Shea, one of the most reliable and trustworthy officers at the Hyde Park station, nearly shot the rear end out of the police station one night when a ghost invaded the sleeping quarters on the third floor. Shea had gone to bed shortly after midnight, and was sleeping soundly along about 2 o’clock when he was aroused by something tugging at the bed covers. The room was pitch dark, and Shea, who was only half awake, did nothing more at first than to reach down with one hand after the disappearing bed clothes. A few minutes later the quilts again were pulled from the bed, and the police officer, thoroughly awake, thought that somebody was trying to play a joke on him. This time the policeman lay with his eyes open, watching for the intruder, and determined, if any one appeared, to shoot his revolver into the ceiling to show that he, too, enjoyed the fun. As he lay thus, with his fingers tightly gripping the handle of his revolver, he was horrified to see a genuine ghost step from behind a clothes locker and approach his bed. Shea says the intruder was shaped like a woman, except that it had only one eye, which shone with a blue sort of light. Stealthily approaching his bed, until it stood within a foot of him, the ghost slowly put out a hand toward him. By that time Shea, who would rather chase an armed highwayman into a dark alley than eat, was as cold as an icicle, and was clutching his revolver handle so firmly that his fingers are bent yet from the pressure. Slowly the extended hand of the ghost gathered up the corners of his bed quilts, and as slowly pulled them from him on to the floor. Then the ghost retreated to its position behind the locker, where it could watch him with its one blue ye until he had gathered up the quilts again. Shea declares with all the vigor he can summon that he lay there eyeing that ghost for an hour. By that time, he says, his courage returned to him, and with his gathering strength he leveled his revolver at the hideous eye before him, and then jerked the trigger. With the shooting there was a commotion downstairs, where some of the other night men were playing cards, and across the street in the Holland Hotel, where hundreds of guests were sleeping. Patrol Wagon Driver Thomas Murnane threw up his job at the Grand Crossing station rather than put up with the ghosts that make their headquarters there. Until a year ago, when Murnane resigned, a ghost appeared regularly at the station every night and found its chief delight in taking the harness off the patrol wagon horses. As required by the rules of the department, one team of horses is kept harnessed all night, and Murnane declared before he left the service that the black figure of a man entered the barn every night and calmly removed the harness from his team. 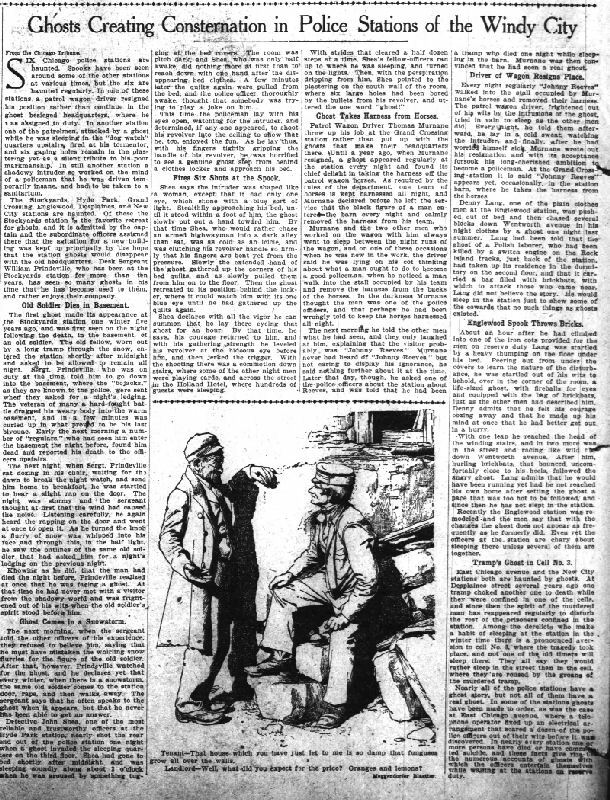 Murnane and the two other men who worked on the wagon with him always went to sleep between the night runs of the wagon, and on one of these occasions when he was new in the work, the driver said he was lying on his cot thinking about what a man ought to do to become a good policeman, when he noticed a man walk into the stall occupied by his team and remove the harness from the backs of the horses. In the darkness Murnane thought the man was one of the police officers, and that perhaps he had been wrongly told to keep the horses harnessed all night. The next morning he told the other men what he had seen, and they only laughed at him, explaining that the visitor probably was “Johnny Reeves.” Murnane never had heard of “Johnny Reeves,” but not caring to display his ignorance, he said nothing further about it at the time. Later that day, though, he asked one of the police officers about the station about Reeves, and was told that he had been a tramp who died one night while sleeping in the barn. Murnane was then convinced that he had seen a real ghost. Every night regularly “Johnny Reeves’ walked into the stall occupied by Murnane’s horses and removed their harness. The patrol wagon driver, frightened out of his wits by the intrusions of the the ghost, tried in vain to sleep as the other men did. Every night, he told them afterward, he lay in a cold sweat, watching the intruder, and finally, after he had worried himself sick, Murnane wrote out his resignation and with its acceptance forsook his long-cherished ambition to become a policeman. At the Grand Crossing station it is said “Johnny Reeves” appears yet, occasionally, in the station bar, where he takes the harness from the horses. Denny Lang, one of the plain clothes men at the Englewood station, was pushed out of bed and then chased several blocks down Wentworth avenue in his night clothes by a ghost one night last summer. Lang had been told that the ghost of a Polish laborer, who had been killed by a switch engine on the Rock Island tracks, just back of the station, had taken up its residence in the dormitory on the second floor, and that it carried a bag filled with brickbats, with which to attack those who came near. Lang did not believe the story. He would sleep in the station just to show some of the cowards that no such things as ghosts existed. About an hour after he had climbed into one of the iron cots provided for the men on reserve duty, Lang was startled by a heavy thumping on the floor under his bed. Peering out from under the covers to learn the nature of the disturbance, he was startled out of his wits to behold, over in the corner of the room, a life-sized ghost, with fireballs for eyes and equipped with the bag of brickbats, just as the other men had described him. Denny admits that he felt his courage oozing away and that he made up his mind at once that he had better get out in a hurry. With one leap he reached the head of the winding stairs, and in two more was in the street and racing like wild fire down Wentworth avenue. After him, hurling brickbats, that bounced uncomfortably close to his heels, followed the angry ghost. Lang admits that he would have been running yet had he not reached his own home after setting the ghost a pace that was too hot to be followed, and since then he has not slept in the station. Recently the Englewood station was remodeled and the men say that with the changes the ghost does not appear as frequently as he formerly did. Even yet the officers at the station are chary about sleeping there unless several of them are together. East Chicago avenue and the New City stations both are haunted by ghosts. At Desplaines street several years ago one tramp choked another one to death while they were confined in one of the cells, and since then the spirit of the murdered man has reappeared regularly to disturb the rest of the prisoners confined in the station. Among the derelicts who make a habit of sleeping at the station in the winter time there is a pronounced aversion to cell No. 3, where the tragedy took place, and not one of the old timers will sleep there. They all say they would rather sleep in the street than in the cell, where they are roused by the groans of the murdered tramp. Nearly all of the police stations have a ghost story, but not all of them have a real ghost. In some of the stations ghosts have been made to order, as was the case in East Chicago avenue, where a telephone operator fixed up an electrical arrangement that scared a dozen of the police officers out of their wits before it was discovered. In nearly every station one or more persons have died or have committed suicide, and these facts give rise to the numerous accounts of ghosts with which the officers entertain themselves while waiting at the stations on reserve duty.